I was raised on shopping malls. Living in the surburbs of sprawling metropolitan areas my entire childhood meant being brought along on various trips. My mom would often deposit me at the bookstore, or better yet, the toy store, while she went off and took care of real shopping. During that time, I became familiar with the entire line of Legos, learned the rules of D&D, and played the first 10 minutes of countless video games at demo stations. Over time, I grew up. A little. I could stand to shop with my mom when she was looking at pants for me (instead of her needing to find me after having scouted out the prices). But now, I rarely go to malls. I’m of the impression that they aren’t quite as important here in the Bay Area as they were back in Katy, Texas, but on the whole, I don’t do much shopping in-person anymore. Part of that is not having a car to get to such places, but even that’s okay, because the internet lets me do all the shopping I want from home. Apparently I’m not alone, according to this article. Shopping malls, once thought to be the great center of commerce, have been dying around the United States. The article doesn’t focus too much on the reasons why this has been happening, but it does point out 2 main reasons. First, we apparently rediscovered our roots in stores and restaurants that can be entered from the street. I think there’s something classy in imagining ourselves poking into independent boutiques, looking through storefront windows on a sunny day, and living it up in the city. That’s something I can get behind. The second reason, however, is the bigger culprit in this situation, and that’s online shopping. It’s so easy. I remember coming down for breakfast on Sunday mornings and seeing my parents trawling over ads, trying to pick out the best deals. My mom had her stacks of coupon clippings that would get sorted into piles. And for important things like big electronics, this could go on for weeks. Now, it’s really tidy. All available products are easily found via search engines. The search engines even compare prices for you, making it easy to find the lowest cost seller. And in moments of confusion, there are many forums and buying guides to help out. But like a lot of conveniences, there’s something lost, and I think it’s the whole “shopping” thing. I don’t think of myself as much of a shopper, but I do enjoy looking at junk. I’m sure that attitude is frustrating enough to storeowners, but I’ve managed to make things even worse for them as I see things in stores that I later by online because it’s cheaper and gets me out of impulse buys. Yikes. Somewhere in the economics of purchases, I’ve lost the value of the shopping experience. Sure, I can buy the exact same book on Amazon for $5 cheaper than at Barnes & Noble, but I didn’t spend a half-hour perusing books, walking through ranges of shelves, and discovering new reads online. For myself, the economics as is work out perfectly: I can browse in-person for free and buy for less online. But the physical store deserves the final price I pay for the book for having helped me find it, as well as the retail premium above online prices for the shopping experience. Honestly, this will be a tough fight. My mom’s coupon-clipping ways and exhaustive (and exhausting) deal-hunting make it hard for me to believe that it’s right to not go for the cheapest option. I’m sure I’ll lose it many times, but at least I’m conscious of it. I won’t suddenly buy more than I do now, but when I see that kitchen gadget in-person, I’ll try not to let myself out of the purchase because I’ll buy it online later. And I’ll try to do that everywhere. I have enough elitist, yuppie guilt to support the mom & pop shops and small, unique businesses, but I think I need to push to keep it in mind for the big retailers, too. I have too much nostalgia for Fairview Mall, Katy Mills, the Target at I-10 and Fry Road, and other to not give back for some of it. My family doesn’t go out to eat much. My mom was almost always willing to cook, with the notable exception being after “Money Day” when she, as treasurer for the high school band boosters, ran kids through stations to pay for yearly expenses. Other than that, we generally avoid fast food and have tons of leftovers to tide us through slower days. As such, we never really developed a pattern or preference for any particular places, though we tended towards Chinese restaurants. The most exciting place in recent memory is a Chinese buffet opened about 5 minutes from our house. Rave reviews from my parents, especially my mom who tends to describe most places as “okay”, have taken me there twice, most recently last night with my family. This place has managed to stand out above other Chinese buffets by offering sushi. Although they don’t have the most original rolls, the quality is decent, and we’re not particularly discerning about it, either. The sushi does present a slight problem in that it throws off the system. Past experience with Chinese buffets has developed into a strategy, which is simply known as “beating the buffet”: eat more than what you would typically pay for an equivalent amount of food not at a buffet. Obviously, you want to go to the buffet to fill up. The next most important thing is to eat mostly foods that are worth a lot compared to how filling they are. For example, seafood, such as crab legs, and sushi are good targets. Although sushi does have quite a bit of rice, it’s well-compensated by how expensive sushi is. The sucker foods, however, are things like white rice and soups. Those are a poor investment of stomach space. My dad is particularly good about focusing on the important things: he’ll warm up with maybe a wonton soup (heavy on the wontons), then transition into a plate of crab legs, followed by a plate of crawfish and shrimp. After leaving the shattered remains of many shells, he’ll move onto the usual items, being all variety of fried meats and other entree, then finish out with fruit. The last part of the strategy is the willingness to be a little shameless. The restaurant will pressure you into leaving soon, either by bringing out the check, cutting off your water and refills unless you ask, and constantly taking away plates and asking if you’re done. You can eat more if you stay longer. Therefore, stay longer and don’t worry about them, especially if you think you’ll get a second wind. And don’t worry about tipping too much. Maybe I’m just a bad person, but I don’t tip much at Chinese restaurants. It’s not expected. Admittedly, I’m not quite as tough as my dad is when it comes to beating the buffet, but I try. Last night, I started with wonton soup, sushi, and shrimp. I moved onto a plate of entrees, taking just a little from every option, then had one more plate with the items I determined were the best. Then was the dessert plate and some soft serve. Success. During the dinner conversation, I mentioned how convenient it was to have this place in Katy and not to have to drive out to our old mainstay in Sugarland. My mom complained about the quality there, which caught me off-guard. Chinese buffets are not known for quality. Quality is for real restaurants; buffets are for volume. The seafood is good, not great. The important thing is that you can get a lot of it. Caution about the jello, too. Chinese jello has a lot more gelatin than what you might get in Kraft Jell-O, so it’s hard and not very sweet. Frankly, I think it’s gross but get suckered for it every time. I have determined that the only way to come away from a Chinese buffet is with a mild stomachache. If you didn’t work hard to beat the buffet by overeating, somewhere along the way, the fried food or mild food poisoning should finish you off. Fortunately, I have come to associate that feeling with generally good things. Thinking back, my family has always had a Chinese buffet that we could go to. In Toronto, it was Buffet King. In Houston, we had Happy Panda/China Bear (new ownership apparently was somewhat satisfied with the name, but not entirely) until the new place. I’m willing to bet that we eat Chinese buffet more often than Chinese sitdown with the lazy susan and communal dishes. It just doesn’t seem worth it to pay more for more seafood. On a whirlwind of a trip, I spent two nights and one day in Toronto last weekend, though that only begins to describe how strange of a trip it was for me. I can’t remember having ever flown into Toronto before. My family always drives because our trip across the border is actually just a shopping trip for Canadian apparel and food. I have never declined the chance to see a Jays game either and did so this time only because I had seen them a week before. Strangest of all, though, was entering Canadian not as a citizen but instead with an American passport. As far as logistics go, that doesn’t change much. Instead of filling out how long I was out of the country (3 years, I think? ), I wrote in how long I would be visiting for. Instead of the immigration officer asking me what I was doing out of the country, I was asked what I was doing in the country. And maybe one might guess that I was born in Toronto because my reason for visiting was “family,” but that really doesn’t come up in idle conversation either. For all intents and purposes, I traveled as an American. Many of my classmates and friends are likely offended by this portrayal. 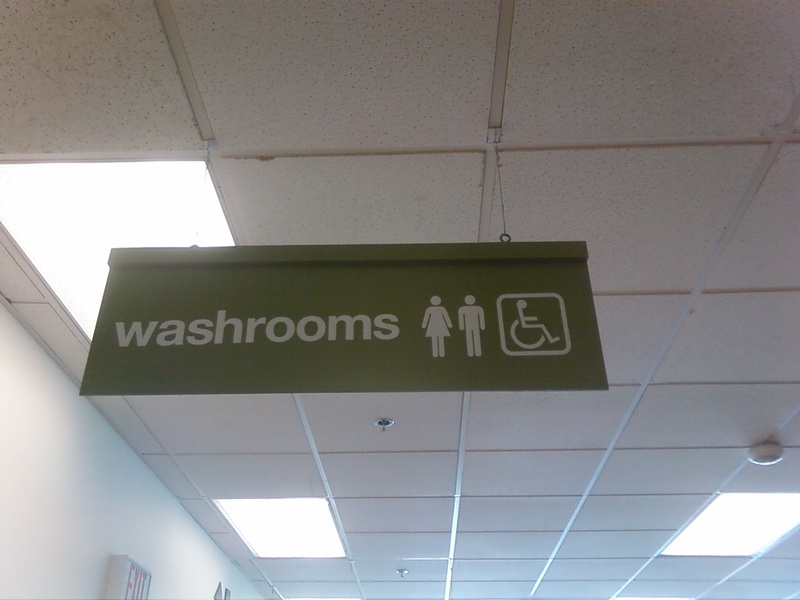 You say “bathroom,” I say “washroom.” You lost at hockey in the last Olympics, I won. By now, however, I know far more about being American than being Canadian. When I went to dinner with my cousins, they asked me a variety of questions about American life, like “Is marching band really like the movie ‘Drumline’?” or “How do you like the imperial system?”. A daily email with headlines from the Toronto Star remains my last connection to Canadian culture, which I generally don’t understand. As a case in point, when I was at Chapters, I was looking around for a quick book on Canadian history. If it hasn’t happened already, someone needs to write a book for emigrated Canadians who want to reclaim some heritage without really putting any effort into it. I have accepted the fact that I’m more American at this point than Canadian. The label “Texan” doesn’t seem as offensive as it one did, and although I maintain that Houston is not an exciting place, I don’t think I would be honest to myself or fair to reject that bit. Country music is not intrinsically bad, “y’all” is actually a useful phrase, and conservative values actually do have some basis in thought. And although I’ll still listen to Ben Folds while working, point out that “you guys are dumb,” and remain the equally stubborn liberal I am, the stereotypical Texan has grown on me, which is a great lead-in for all the cultures in-between, both ideologically and geographically. My memory of Toronto is somewhat foggy. I remember a few landmarks here and there, but renovations mean that even most of those are gone. As I was riding around in the car looking eagerly out the window for any remnants of what I knew, I concluded that I pretty much don’t know my hometown anymore. Driven around for a minute, I probably couldn’t tell you whether I was in Toronto or Vancouver, knowing the city to be Canadian only because of the French under all of the English. One truly doesn’t pay attention to directions or locations until driving, but I would hope to at least recognize what I call home a little better. That afternoon, I walked the 5 minutes down to Hollywood Public School where I went to school for junior kindergarten and 3rd grade. I couldn’t wait to see the vast fields I ran around on, the towering walls for huge wallball games, and the hill we would sled down. As you might expect from any visit to a childhood memory, however, it wasn’t that. The field might have stretched 2 soccer fields. I was amazed that we ever crowded 15 people around that wall. And I bounded the hill in 4 steps. Sledding backwards perhaps wasn’t as hazardous as I had thought. The obvious change is that I’m physically bigger than I was, surprised as you might be from my last post. To be less prosaic, though, the world was a lot bigger back then than it is now. When I had only lived in one city and only gone on a few, isolated road trips, my world was only a few suburbs in the Toronto metropolitan area, and my playground was that around the school, which possessed a disproportionate amount of my mental map and even more of my memories. I agonized awhile ago about where I would tell people I’m from, and the answer is far trickier than it would seem. To add to the confusion, when I have been traveling away from school, the Bay Area is my default response since that is where I spend most of my time nowadays. And to layer on the difficulty now is what nationality I am. It frankly doesn’t seem fair to say “Canadian” anymore as I whip out my American passport and clearly have dated memories about what Canada is. And the stickers on my computer and preference for sports teams don’t quite scream red, white, and blue with bald eagles soaring through the sky, either. It frankly doesn’t matter, though, as those sorts of questions are no more than conversation starters anyways. I can’t answer any of those sorts of questions entirely honestly, but come story time on that, at least I have it all straight in my head. Every kid, at some point, wishes that they could just eat ice cream for dinner. Food is food, and ice cream just happens to be one of the more delicious options. As pointed out by my friend KevBaum, my peers and I at that age where we can make our decisions but aren’t responsible enough to make consistently good ones. So for dinner a few night ago, I ate ice cream. It was delicious. And that’s a sign that our lives are great right now. Classes ended 2 weeks ago, my finals a week after that, and my total freedom also as I’m already a half week into my summer job. The summer brings along exciting things to look forward to, but I think it’s my time to reflect on another year gone. I learned that communication is a joint activity. I learned the lyrics to “Hey, Soul Sister.” I learned how to clean battery contacts with vinegar. I learned about what we do and don’t know about receptive field changes in neurons in visual areas. I learned about how schools are selected for bowl games. I learned that Hewlett 200 is not a good room for a comedy show. I learned about legitimately putting together a theme for a blog. I learned how to kayak. I learned how to play “contact.” I learned about how machine learning techniques can improve speed dating techniques. I learned how to put together a syllabus for a class. I learned about Merlinpeen. I learned how to integrate sensory details into nonfiction work. It seems like I’ve themed my past year end entries around some big lesson of the year. Freshmen year of college was about seeing a bigger world. Sophomore year was actually figuring out why I liked what I was learning about. I think this year was about realizing that I have fun like a normal person, which kind of has two parts. I feel blessed to be at college where this type of behavior isn’t cause for concern. I’m not beyond having long, late night conversations with friends about Starcraft 2, but among my regular group of friends, I think we’re far more likely to be talking about sports, movies, and burritos. I think I’ve been fighting my curiosity and fascination with pop culture for a long time. Thanks to the influence of my hallmates, I think I’ve listened to far more Ke$ha and Gaga than Canadian Brass and Gene Pokorny this year, and I might be better at 7 Degrees of Kevin Bacon than chess. It’s not fair to say that I have a curiosity with pop culture. Said like that, I watch pop culture unravel as an academic analysis of societal trends and preferences. And that’s pretty dorky. After all these years of eschewing pop culture as mindless and unproductive, I’m beginning to see what the appeal is. It’s fun. And I think that’s something I was missing for awhile there. As much fun as sophomore year was, junior year has been a huge bounce back for me. Particularly, my entire floor in Robinson is coming off a huge high that we had all of spring quarter. At first, we were just excited to be entirely reunited after a few people left for the winter to study abroad, but as the school year started to feel long, we never let up on the distractions. Whether it was a sleepover on the balcony or a continuous conversation in the hallway from after dinner to bedtime as people cycled in and out, I’m glad we found activities not centered around our N64 or YTMND. Second, there shouldn’t be any guilt with having fun. The great news about summer is that there are firm boundaries and expectations about investment in work. Most jobs are 9 to 5, and when the clock strikes 5, it’s permissible to drop everything and move on with the rest of life. In essence, there’s no guilt about not working long hours for most jobs. In many ways, school is a job, but one very big difference is that the school day is never really over. During the school year, literally every moment is a potentially study moment, and with each tick, you’re either making it or wasting it. Which is the worst possible way to think about it. Because we’re irresponsible college students, we spend time doing all sorts of random things, from watching Lakers-Celtics games to visiting Buddhist monasteries. Many extracurricular activities are done strictly for fun and relaxation, and those are moments spent not studying. I realized that as soon as I thought about that fact, I ruined the movie I was watching or the game of racquetball I was playing. Instead of enjoying and relaxing, I was worrying about my opportunity costs. It would be the worst possible use of my time: not studying and not having fun. Having heard my lessons, you shouldn’t worry that I’ve lived some hedonistic lifestyle and forsaken my studies for fun alternatives. Although it’s cliche, this all boils down to me finding some sort of balance in my life. The classic divide is between work and pleasure, but my situation can be summarized as work guilt. Too little, and I might never get around to doing what I need to. Too much, and I’m stuck worrying without being any more productive. Although there are always ups and downs, I feel like I had it all this past year. I’m proud of what I accomplished, I’m so pleased with the random experiences that paved the path, and I’m grateful for the people around me who laughed when I laughed, distracted me when I was tense, and supported me when I went into the tank. Life wasn’t a year-long Hawaiian vacation, but that’s not really how you have ice cream for dinner anyways.